Dictionaries were one of the first things I’ve watched become almost completely obliterated by the internet, but they’re still around and still super useful. While they might seem like an outdated concept, the function they serve can be invaluable, so even if you don’t want to carry around a bulky, expensive, actual book version, the handy Cambridge Advanced Learner’s Dictionary app is a simple way to carry around a lot of language in your pocket. Cambridge Advanced Learner’s Dictionary is exactly what it sounds like: an easy to use and understand dictionary of the English language. 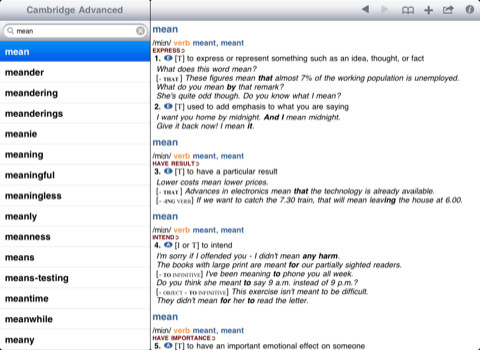 It’s designed primarily for advanced students of English as a second language. 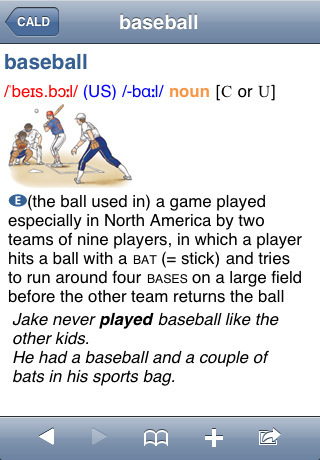 I could maybe see it as a useful learning tool for elementary and middle school students as well, but the vocabulary is far too limited for consistent help for high school and up. To search, all you have to do is start entering a word. A fresh word list is instantly generated with each new letter, much like Google Instant, so you don’t even need to fill in the entire word in some cases, but you will have to select which word you want, even if you entered in the entire word and there is only one match. In addition to a standard word search, there are a few special search extras. Take the keyword search: if you wanted all the words with “dog” in them, a regular word search looking things up alphabetically might find you “dogwood” or “dog biscuit”, but the keyword search would also bring up “guide dog” and “hot dog”. There are also “Fuzzy” and “Wild Card” search mechanisms when you’re not exactly sure what the word is. The over 170,000 definitions are laid out in a very short and basic manner. This is fantastic if you are starting with a limited vocabulary, but it can make grasping the nuances a little difficult and I found that while 170,000 words sounds like a lot, it was far from being totally comprehensive. More common words frequently come with usage phrases to help make things clearer. A few words even come with helpful images, but not every definition comes with these useful extras. There is a pronunciation key, but you’ll need to know IPA to make good use of it as there are no audio files to help you with the more difficult sounds. Synonyms are occasionally linked as well, but not always and the list is always far from comprehensive. If you’re hoping to use this as a thesaurus as well, I would look elsewhere. Overall, I wasn’t super impressed by this dictionary. While it is certainly functional and simple to use, the actual content feels lacking somehow and it is missing features, like audio pronunciation keys and word derivations, which would help make it a more comprehensive tool. It is okay for basic usage, but it’s not a great dictionary and it doesn’t give you much of anything that you wouldn’t find as good or better for free on the internet. AppSafari review of Cambridge Advanced Learner’s Dictionary was written by Tracy Yonemoto on June 20th, 2011 and categorized under App Store, Education, iPad apps, Reference, Search, Universal. Page viewed 6796 times, 7 so far today. Need help on using these apps? Please read the Help Page.